Join us on August 8th, 2015 for a 2 1/2 hour clinic on the ‘sweet science’ of western boxing with Coach Ricardo Acuna. 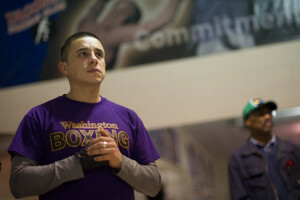 Ricardo is a former amateur competitor and is currently coaching for the University of Washington and has helped develop an Olympic Team Qualifier, 4 state Golden Gloves champions, 1 Regional Golden Gloves champion, 3 National champions in the NCBA women’s division as well as a Northwest Regional champion for the UW Boxing Team. Coach Acuna became a friend of MKG Seattle when he began coaching MKG owners Tammy and Andy Wilson privately and helping them with their boxing skills. Hailing from Guadalajara, MX Coach Acuna competed extensively in amateur boxing, semi-pro, Muay Thai and Tae Kwon Do before moving to Seattle. With his diverse background and personal challenges with injury he has developed an eye for detail and an ability to work with people of all levels in creative and interesting ways. The workshop has been designed to appeal to people of all levels and will include both beginning and more advanced material. It is highly recommended for those who’d like to get some details not commonly covered as well as looking for creative drills to improve your skills or your teams. This clinic will open to all levels and is open to the public. As a courtesy to Coach Ricardo and MKG after you register please confirm your attendance on our Facebook Event page HERE.